DITEC is one of the most trusted names in car foiling in Dubai. We offer professional auto detailing services to customers in UAE, at prices that are easy to afford. Whether you are looking to give your own ride a fresh, new, unique look, or bring more awareness to your company or brand through a branded car foil, we can help you. When you foil a car, you want to do everything right to ensure the foil is installed properly and there are no unsightly air bubbles or folds upon installation. With DITEC, you have full end-to-end solutions to help you get the design you want on your vehicle without any hassle. Aside from installing the wrapping, we can take of the design and prepping as well. This means, if you are looking for design ideas to fit on to the foil, we can help you. Our in-house Dubai design team is capable of producing a digital visualisation of proposed designs and layouts. This is perfect for businesses and companies that want to use their vehicles for mobile branding. 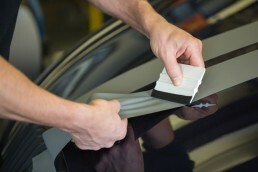 Our company can also prep the vehicle before the foiling process. We have a team of trained field personnel who can do the prep for you. We will soap and wash the vehicle with water to ensure a clean, smooth surface prior to application. DITEC Dubai uses only the highest quality materials when we foil a car to guarantee durable lasting designs. We will give you multiple options according to the finish and design you want to achieve and the foiling process we will be employing for the implementation. This allows our UAE customers the freedom to choose the material that fits their requirements and budget. So if you are looking for professionals in UAE who can perform car foiling for you, contact DITEC today.